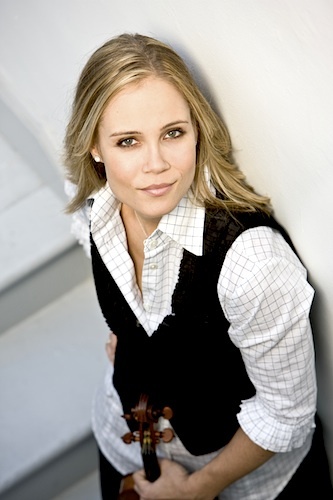 Leila Josefowicz premiered John Adams’ Scheherazade.2 with the New York Philharmonic. The New York Times: "Long an Adams champion, Ms. Josefowicz gave a dazzling and inspired performance, backed by the glittering, rhapsodic and supremely confident playing of the orchestra under Mr. Gilbert." San Francisco Classical Voice: "A captivating figure onstage, her feet were planted on the floor as her body swayed back and forth with the currents of the music. The violin’s solo flights were raw and restless from the start. Her tone was defiant without being brash or glib, and lyrical sections did not descend into sentimentality." Gil Shaham performed Bach's six solo Sonatas and Partitas in Los Angeles. Violinist.com: "Aside from displaying the astonishing athleticism and mental stamina required to perform all 32 movements live and by memory, Shaham also turned these familiar works on their head." Los Angeles Times: "Indeed, if you could get beyond the looming screen and distracting images, Shaham often played well. His wasn't the most probing Bach, but it was always fluent and musical." Christian Tetzlaff performed works by Bach and Bartók in London. The Guardian: "Generally...there was a searching, ephemeral quality to his playing, characterised by lightness; the times when he chose to bring out his fullest, most muscular tone really made an impact." Janine Jansen performed the Tchaikovsky with the New Zealand Symphony Orchestra. Scoop: "She did indeed beat her violin black and blue; the sturdy Stradivarius was, fortunately, equal to the punishment, but was surely taken to its limits. It was all done out of love, of course ... actually, Ms Jansen seemed to be making love both to the concerto and to her handsome husband, conductor Daniel Blendulf, on the podium close beside her." Anne-Sophie Mutter performed the Beethoven with the Luigi Cherubini Youth Orchestra in Abu Dhabi. The National: "The 51-year-old cemented her reputation as being technically peerless, particularly in the Allegro ma non troppo, in which Mutter conjured dizzying spirals of melodies." Karen Gomyo performed Mozart's Violin Concerto No. 5 with the Detroit Symphony Orchestra. Detroit Free Press: "Karen Gomyo played (the finale) with high spirits but also with the refined tone and poise that she brought to the rest of the piece." Miranda Liu performed Bartók’s Violin Concerto No. 2 with the Redwood Symphony. San Francisco Classical Voice: "Miranda Liu, the soloist, plowed through her violin part dutifully. She has a heavy tone without much variety of texture in it. What she does have is strength of line, and, as a result, a clear narrative voice. This was one of the most coherent performances of the flinty solo part in this concerto that I’ve been fortunate enough to hear." Diana Cohen performed the Beethoven with the Calgary Philharmonic Orchestra. Calgary Herald: "This is a good work to display many of the positive attributes of Cohen as a violinist: solid preparation, elegance in execution, lyricism, and technical polish." Youjin Lee performed the Beethoven with the Santa Cruz Symphony. Santa Cruz Sentinel: "She played with vitality and an exquisite tone well-deserving of the audience’s immediate standing ovation."